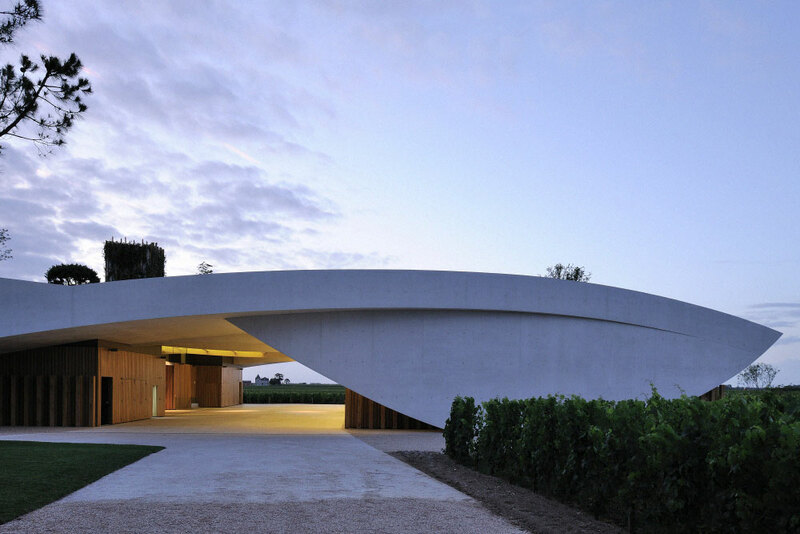 This contemporary free flowing architectural masterpiece was designed by the French architect team of Atelier Christian de Portzamparc for the famous winery Chateau Cheval Blanc in Saint-Émilion, France. 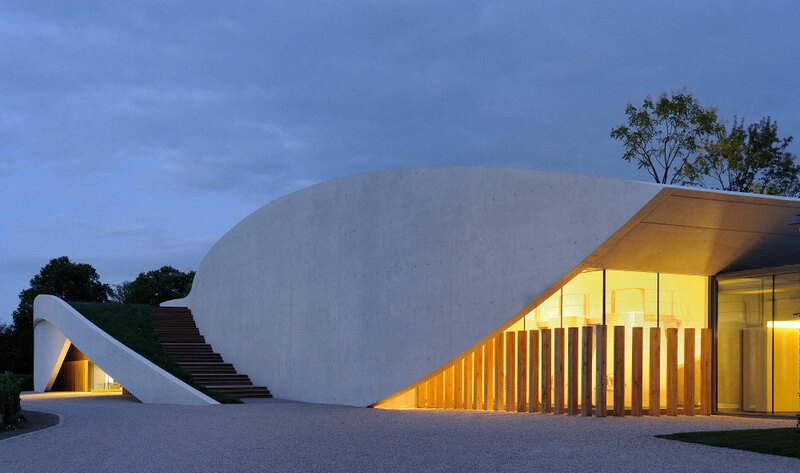 Its distinct organic shape would make Oscar Niemeyer smile. There are some exceptional wines in the world. Cheval Blanc is one of them. When referring to it, people sometimes speak of absolute art. 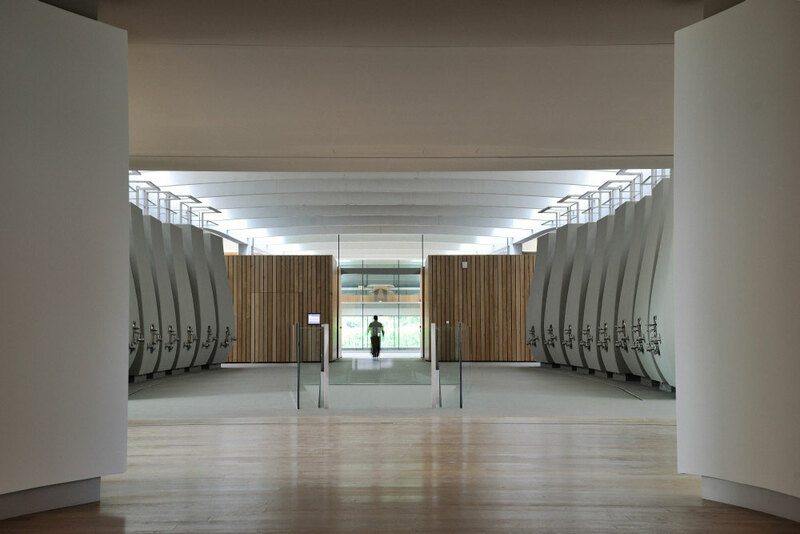 When Baron Frère and Bernard Arnault (the client) decided to endow the estate with a new winery, they aspired to excellence and sought to break new ground. 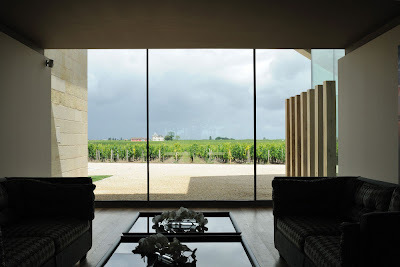 The vinification of Cheval Blanc is a traditional business consistent with a perpetual quest for harmony and balance. 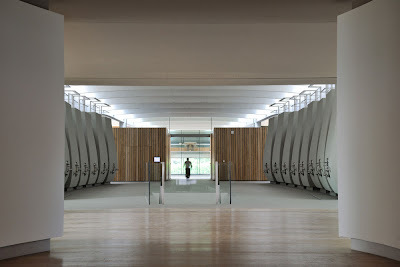 It involves parcel management and respect for the cycle of the vine, constant adaptation to the nature of the grape and thoughtful, measured and considered attention to every action. The programme takes account of the specific features of individual parcels, as well as exacting standards and respect for nature. 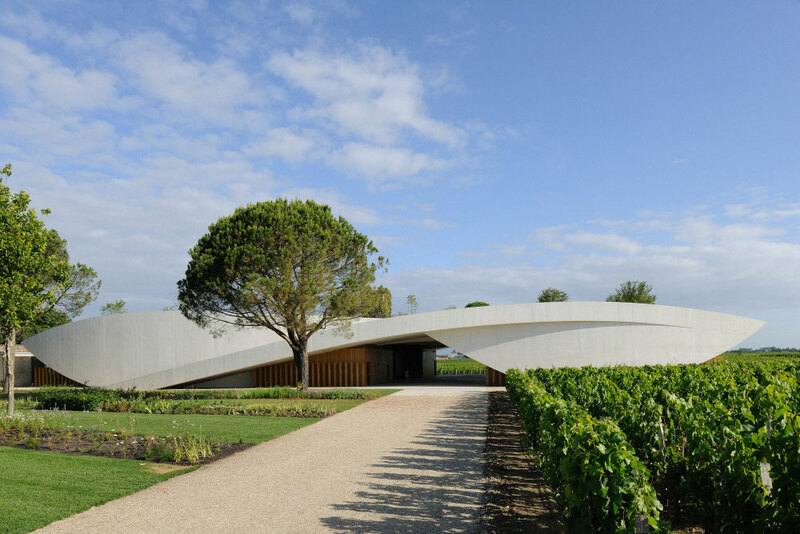 But the owners also wanted something that would anticipate the future while blending into a historic landscape, since Saint-Émilion is a UNESCO World Heritage Site. It was a challenging mission that called for a rare combination of talents. This challenge was taken up by Christian de Portzamparc, who considers that the truth of space cannot be dissociated from the imprint of time. The harmonious relationship between inside and outside has also been a constant source of inspiration. 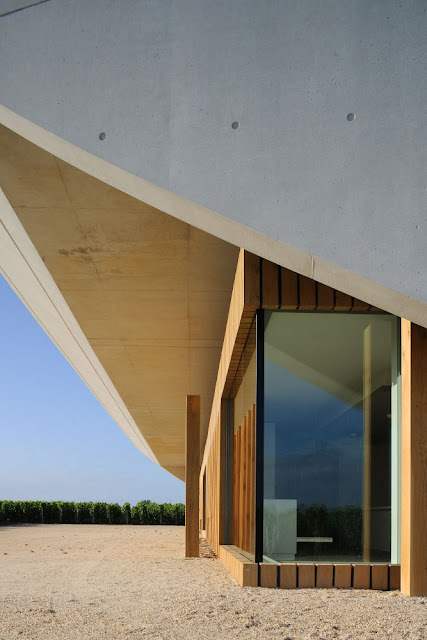 In the heart of the vineyard, the "winery under the hill" initially looks like a promontory extending the château, a lifting of the earth, raised by sails of concrete towards the light and the sky. From a vantage point that seems to float in the air, the eye takes in the swathes of vines and the age-old history of the landscape. 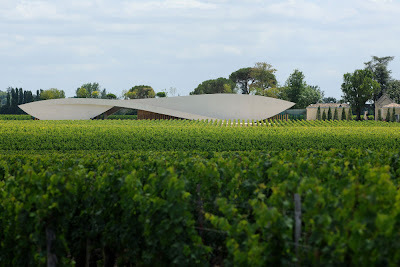 A hill or a hanging garden floating over the vines? What gives the site a certain grace is a discreet cantilever effect suggestive of a pendulum, the geometry of the curved surfaces and their living substance of muted white moulded concrete, the unique atmosphere that derives from the natural light descending earthwards inside the vat house, between the contours of the great concrete vats. This refusal of enclosure, even though inherent in the material, is a remarkable innovation: the "winery under the hill" is a place of concentration, almost of meditation, and yet open to what surrounds it, being as permeable to the light of the vineyard as to the coming and going of workers and visitors. 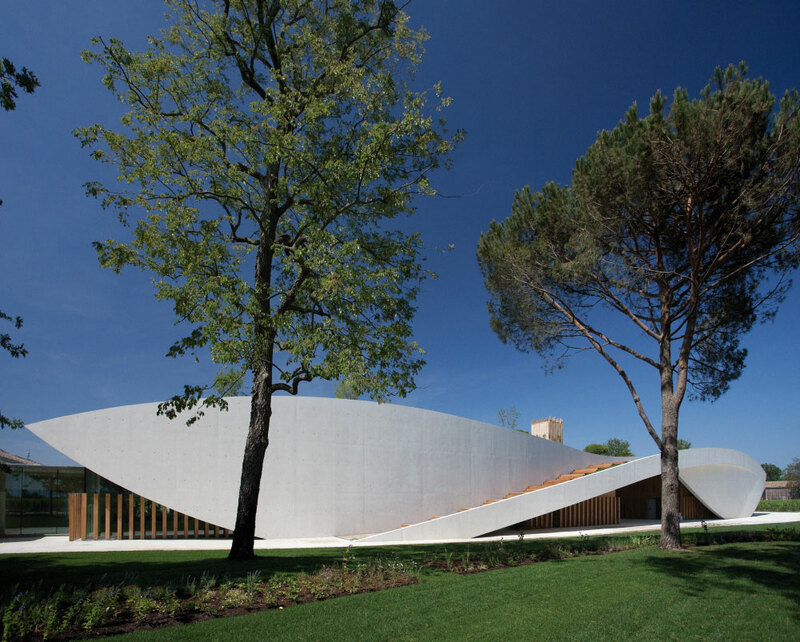 Between inside and outside, the winery is a place of transmutation and human interaction. That grace also derives from the desire, in evidence all around, for perfect harmony between the place and its purpose. 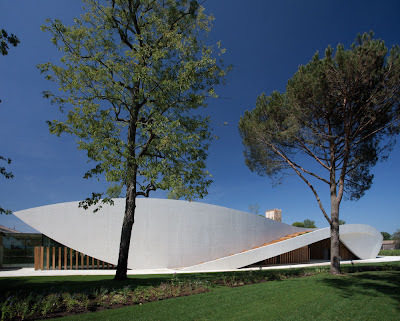 And that is probably where the elegance comes from: we are in the place where an exceptional wine is made, among the sublimated instruments of a highly demanding task that calls for skills to match. No line here is superfluous: everything contributes to the perfection of the actions involved, and it shows. The technology is therefore treated as such: necessary facilities, not objects of ostentation. There are 52 vats because that is what parcel selection requires, and they are made of concrete. If the walls are of mashrabiya, it is to facilitate natural ventilation. The lighting is sober because it does not seek display or decoration. In fact, everything has been designed to replace energy-hungry systems with economical solutions. As a result, the winery is one of the few buildings in the wine business to have High Environmental Quality (HQE) certification, meeting particularly demanding criteria relating not only to the environment but also to the type of materials used, to water, energy and waste management, controlled hygrometry, acoustic, visual and olfactory comfort and the well-being of the people who work there. It is the brand-new vision of a place and a long tradition. 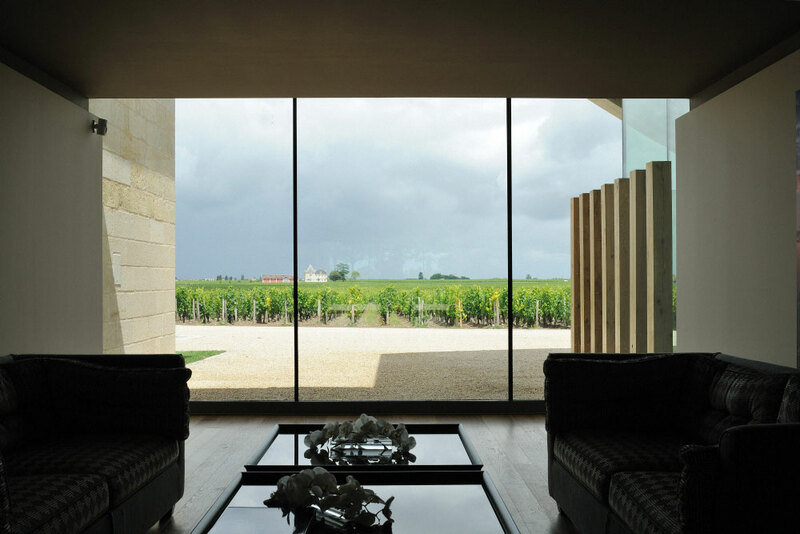 With boldness, high talent and a sensuality made visible, Cheval Blanc looks to the future.